Being a daily cycle commuter, I had been wanting to review the Replay XD 1080 for some time and so was especially pleased when the new Replay XD 1080 Mini was released and I managed to get my hands on one. Smaller and lighter than it's predecessor, it manages to cram the same performance into it's tough aluminium housing. When people think of cameras for their bicycles or motorbikes, many consider the costly GoPro range, but for me, the asthetics of the Replay means it's much more suited to the job. The Replay XD 1080 Mini's barrel design - which has helped this type of camera to become known as a bullet camera - means that it's much more aerodynamic and compact than the GoPro, especially when it's waterproof housing and mounts are taken into consideration. The first thing you notice about the Replay XD 1080 Mini is it's exceptional quality. From the camera itself and it's array of mounts, right through to the instruction booklet, stickers and packaging, the entire bundle is very impressive. Within the smart perspex outer packaging, Replay have included a fabric 'ballistic' case to store everything in when not being used and another smaller microfibre sleeve to protect the camera itself. Some Replay stickers complete a very neat package indeed. The camera is very well put together and the fact that it's waterproof to three metres without the need for an additional housing means that it remains neat and compact when in use. With double o-ring threads at either end of the camera protecting the lens at the front and the memory card slot, switches and power connectors at the rear, the camera will be more than weatherproof for use outdoors in rainy conditions. The mounts are well constructed and very sturdy. While the LowBoy mount simply the camera in one, fixed position, the HeimLock mount offers the ability to move the camera slightly, by using a quick release mechanism. Both of these mounts allow the camera to be twisted throughout 360° to be positioned as required and small lines around the camera help with alignment. Once clipped into any of the SnapTrays provided, the mounts become very sturdy indeed. Three of these SnapTrays are included, and the Flat, Tripod and Curved SnapTrays are each designed for for a slightly different purpose. I used the Curved SnapTray on my cycle helmet and it stuck well, thanks to the 3M adhesive used. I would say that I was slightly concerned that the mount wouldn't adhere to my helmet well, as the adhesive pad would have to sit across a vent hole. However, it has remained stuck very well and I have no concerns as to it falling off. On a motorbike helmet, where it would have a much better contact, it would stick extremely well. The camera only has two external buttons with which to control the camera which are also waterproof to prevent moisture getting inside. The simplistic control system works exceptionally well and makes it easy to control the Replay XD 1080 Mini without having to look at it. The two raised buttons either turn the camera on/off or start/stop recording and can be felt easily through gloves. While the camera has small LCDs that tell you what the camera is currently doing, each button press in also accompanied with a vibration alert which can be felt through your helmet to ensure you know that you're recording. By adjusting the cameras settings, it can be made to start recording with the touch of just one button, but more on that later. At the front, the impact-resistant polycarbonate lens offers a 120 degree field-of-view, enabling the Replay XD 1080 Mini to capture significant detail without the image distorting due to a wide angle fish-eye lens. This lends itself well to the purpose of capturing footage in the case of an incident on the road as all aspects of the image will be clear. Recording at either 1080p at 30 frames-per-second, or 720p at 60 frames-per-second the video quality is excellent. A simple switch, hidden behind the rear bezel, changes between these two main recording options but others are available via an 'advanced' set up solution. With this, it's possible to alter many technical aspects of the Replay XD 1080 Mini, to tailor it exactly to your specific needs. While it's not the most intuitive process, by manually altering a text file found on your memory card, you can tweak features such as exposure, sharpness and contrast, as well as various recording functions. In my case, I activated loop recording and one touch recording, so that it started to record automatically as soon as I turned it on. This meant that during my daily commute, I simply turned the camera on as I started my journey and it would start recording, recording over the oldest footage when the 4GB memory card (supplied) was full. This took around 40 minutes, and I wanted to retain slightly more footage than that so I eventually upgraded to a larger card. With about a two hour battery life, the Replay XD 1080 Mini offers enough recording time for many journeys, but it's not going to last for a full day's cycle ride by any means. With this in mind, there are a range of power accessories available, from three and six hour battery packs to hardwire kits. These open the door to many different applications for cyclists and motorcyclists and all offer the same high level of build quality throughout. 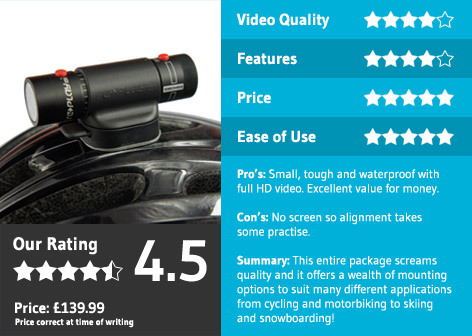 Other accessories include a ReView monitor to view footage while out and about and a mountain of mounting options for almost every conceivable eventuality. Overall, the Replay XD 1080 Mini is a great camera, either for the daily commuter, or for the more 'extreme' user. I found that when I had the camera mounted on my helmet the constant movement suited the 720p setting better, due to the higher frame rate, and produced a smoother picture. I also experimented with the WindBreaker stickers that came in the package and found that they do an effective job of cutting out wind noise, especially if travelling at high speeds. I feel confident that in the case of any incident I will have a detailed record of the events leading up to it which I can refer to if necessary. The footage quality is good enough to capture vehicle registrations and other details, even at speed, and by mounting the camera on my helmet it meant it was almost always focussed on danger areas. For more recreational activities, such as snowboarding, I look forward to experimenting with the many other mounting options.